Fall and spring are my favorite times of year. The weather typically isn’t too hot that you are sweating your rear off, but not too cold that you chattering your pearly whites. 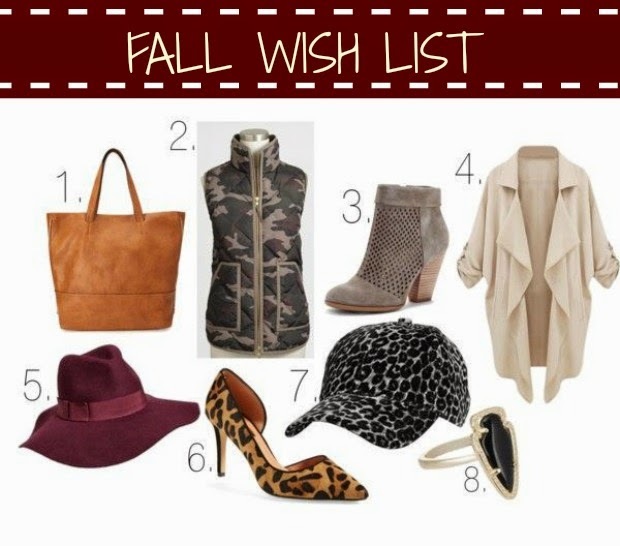 It’s also the time of year that I like to add to my wardrobe and create a wish list of sorts! 1. Forever 21 over sized tote. Sometimes simple is better. I consider these a Marry Poppins type bag…bottomless, but still classic. The price tag is pretty awesome too. 2. J Crew Factory Quilted Vest. I have had my eye on this ever since I saw it! Oh and this one too. I am just waiting for it to go on sale even more! 3. These Sole Society boots are so adorable!!! I have read they are more of a grey than they look in the picture, but I still love them just as much! 4. This Choies jacket is so simple, but can make a statement. It’s something so inexpensive but will be able to complete your whole look. 5. Definitely already purchased this hat in black. But the burgundy is so gorgeous! How cute would it look with the vest and booties? 6. I can never get enough leopard. I really need a pair of leopard flats, but these heels are just too cute to pass up! 7. Can you tell I have a thing for hats? This is so adorable- Totally beats borrowing my husband’s dirty baseball hats! 8. Kendra Scott’s new collection is amazing!! I have been wanting to add to my collection (by collection I mean this necklace). This ring would definitely get some wear! Dang… I want every single thing on this list. Esp. the camo vest, perfect for southern winters!! !